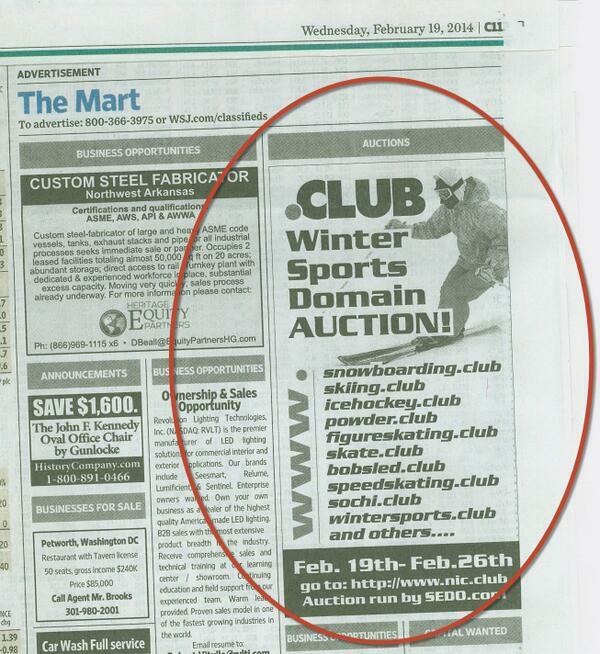 There is an advertisement in for the .Club winter sports domain name auction in the Wall Street Journal today, and I want to share it with you. The .Club auction began today, and it will run through February 26, 2014. The auction includes 25 winter sports-related domain names in the .Club new gTLD extension. 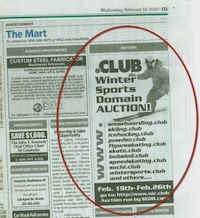 Some of the domain names include Snowboarding.club, Skiing.club, IceHockey.club, Skate.club, and others. The last time I heard about a domain name related advertisement in a major newspaper like the WSJ was when Heritage Auctions ran one for its inaugural live domain auction in the New York Times and Wall Street Journal in November of last year. I am not sure whether Sedo paid for the advertisement or if the .Club registry paid for it, and it will be interesting to see if it leads to any sales. From my perspective, the best way to track results would have been if the .Club registry set up a special tracking url for the auction, such as Auction.Club or something similar. Perhaps they didn’t care about tracking results because awareness was the goal. This is going to be one of the first gTLD specific auctions, and we’ll see what happens. Thanks to Joe Alagna of 101Domain for sharing the image with me. You can purchase .Club and other new domain names at 101 Domain. .Club is fairly well funded and is spending a lot to promote .club. Will be interesting to watch how this pans out. If Sedo paid for it they would have had their branding on the ad. What baffles me is why wouldn’t they give this information to you and all the other major bloggers to release to the domaining world. I would assume that most of the names in the auction won’t be bought by end users but who knows. Who in their right mind starts an auction but doesn’t tell the biggest target market about it. I received a press release about it and posted it last week. Sorry I missed that one. Adam, Are you using Safari? Yep. along with millions of other iPhone, iPad and mac users. A relatively few compared to all possible .club’s overall would work really great and I’d be happy to have them, but perhaps only a few really…It’s the same principle as with “x.ventures” – there’s probably going to be a few exceptions with almost all TLD’s even if you wouldn’t dream of having most of the normally best keywords before the “dot.” I would agree that .club is one of the better ones, though, so there would likely be more desirable ones than with many other TLD’s. But let’s take a great example: “Stocks.” With Stocks.com, you could potentially be “set for life,” but it’s very likely I wouldn’t even pay reg fee for “Stocks.club” unless the fee was quite low. And I don’t care how much anyone tries to suggest “oh no, a club about stocks has great potential and there’s probably already people out there who would buy it,” as far as I’m concerned that would be mostly baloney. Sure, **maybe** it could go for $x x x to $x , x x x if selling is your goal, maybe more if you were fortunate, but as far as I’m concerned it would just not be worth the trouble. And yes, without even doing a search now, I’m confident that in this big country of ours there are already clubs out there pertaining to stocks to one degree or another, but as far as I’m concerned “stocks.club” is still awkward at best, whereas stocks.com is the one that could really potentially change your whole life and that of your family. Sure, anything can happen, but I’d pass. In fact, “gardening.club” is probably more valuable than one like “stocks.club,” but I’d pick the latter in .com any day and suspect others would too. A fan of Elliot’s Blog….Sorry DomainInvesting.com, I wanted to chime in here with a response. To clarify, the WSJ ad was run by .CLUB as a general awareness campaign and to support SEDO’s first .CLUB auction. For .CLUB this is simply the very beginning. We have, as Andrew pointed out, been well capitalized. We raised 8.2 million and spent more than 5.5 million to date on the auction, marketing, and yes the lawyers. Fortunately we have a decent amount of powder left to launch .CLUB in a big way. We have also been aggressive on price, matching the wholesale price of .com. For us this isn’t about selling domains, or making short term profit….its about launching a worldwide global brand. Ultimately any gTLD can hype their name but if they can’t get real users, big brands, domain entrepreneurs, large fan clubs etc using their name, investors will lose interest and ultimately those who bought those names will lose out. As for Safari, .CLUB was updated in the public suffix list in December which means all new versions that pull from that database will resolve .CLUB extensions. I would expect that there will be a 3 to 6 month delay for Safari users for a new extensions launching. In the meantime the Google results will give us top ranking. Single run advertising like this is typically a waste. If you are a regular follower of WSJ ads under the mart (I am) you will notice that only certain ones repeat over and over again. I saw this ad of course because it was domain related. You can’t run an advertisement and expect payback you have to run the same add many times. That said in the mid 90’s I ran similar advertising for domain registration and definitely picked up business from those ads and kept running them. (But that was for simple domain registration and hosting..) And the landscape was much different then you could just reach out and grab business since there was little competition (this was in the days when Network Solutions registered domains and you need to give them DNS servers and fill out an arcane registration form).